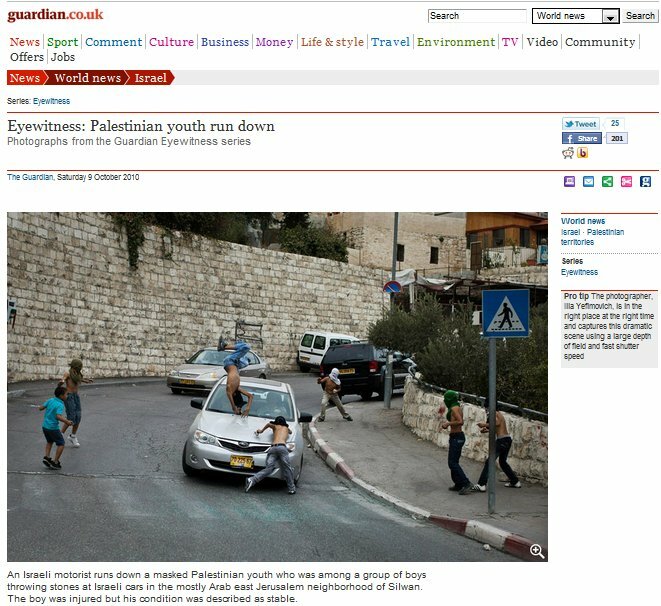 Recall the Guardian’s coverage of the events in Silwan back in October, in a photograph story entitled, “Palestinian Youth Run Down,” – a story that didn’t even attempt to provide any further information that could have served to contextualize the sensationalist image. The following video effectively fisks the original story as it was covered by the Guardian, and much of the mainstream media, and comes to a very clear and persuasive conclusion. It would be interesting to find the photographers and ask them a) why they were there at the time and b) why the hell they didn’t help the boy after having just seen him get hit by a car. Ilia Yefimovich is named in the Guardian article. And while we’re there: ask the Guardian editor about praising the latter for being “in the right place at the right time and captures this dramatic scene”. It sort of gives the game away, doesn’t it? Plus the Guardian headline and explanatory caption are ridiculous. Pretzelberg – Asking the people who were there makes way too much sense. Better to make armchair CSI observations which are so blatantly half-assed as to insult the intelligence of anyone who doesn’t have a stake in defending Israel or the settlers. Obviously the other car wasn’t stoned because the whole thing was a set up. Why was the car not moving and was anyone inside. Who cares, it’s all staged. It was set up and it was staged, Andrew. It is you who are in denial. If it was staged, those who staged it are hardly going to admit to it, are they? I am not especially inclined that way. But a set up is a set up. Andrew, if you are sincerely interested in limiting settlement growth, defending staged ambushes is hardly going to help, is it? Where’s the mosque in all this footage? Did I miss it? You know it was staged because a) Palestinian kids were throwing rocks and at that point they are fair game for whatever an Israeli does to them and b) they’re Palestinians, it’s what they do. That’s your evidence. andrew, the evidence is that there were at least five photographers (and at least one videographer) who “just happened” to be waiting at that particular spot. As for the “several people helping” that you mentioned–well, for some reason the kid seemed to object most strenuously to being put in the vehicle, didn’t he (starting around 1:47 on the video)? Seemed quite upset about it, in fact. andrew r, what part of this do you not understand? There is evidence that this was a set-up! Why then cling to your delusion? You make yourself look foolish. People, we have here a prime example of the CiF disease of self-serving bias which coupled with phobic avoidance of cognitive dissonance can result in delusional thinking: This chump has read the same evidence as the rest of us and yet he still doesn’t believe it! Rather than deal with the discomfort of being wrong he prefers to make himself look a fool here. Of course, given his most recent contribution, there’s also evidence that he is also intellectually challenged since he resorts to circular reasoning. pretzelberg, have you seen Enderlin’s footage of the Al-Durah hoax? You can find it on the Augean Stables page at http://www.theaugeanstables.com/al-durah-affair-the-dossier/. It’s plain from that why cameramen and others don’t rush to help the “injured” or injured – if it bleeds it leads and they let nothing get in the way of the tortured truth, and, in al-Durah’s case it’s doubtful that he was hit or killed or that he was ever there. What kind of adults would stand there and observe as children throw rocks at cars in moving traffic. They apparently do take the expression, “go play in traffic” literally. A responsible adult would have directed these children to stop if they were in fact concerned about the well being of these children(even if they didn’t give a sh*t about the motorists)—rather they take photographs of the event and then scooping up the damaged children and carting them away. Cars beat out kids every time. You seem to ignore this issue andrew r—Please answer, what kind of responsible adult would stand there and observe as a child runs into a moving vehicle (even if the driver put on the brake immediately, the car does not stop! )—-apparently you too do not care what happens to these children as you ignore the danger to the child in all scenarios. Would you have been cheering safely from the sidelines, taking photo’s from a position of safety as it is not you risking getting hit by two tons of metal ?, or would you intervene because these children might get run over…should these children be risking their well being for someone elses amusement? In the end who is more inherently at risk, the Israeli driver or the Palestinian youth for whom you profess to concern yourself? Andrew R. is in the grip of a pathological delusion: his side/cause simply couldn’t do the sort of thing imputed here, and he couldn’t possibly connive in it, ergo it didn’t happen. We’ve seen this kind of pathology before, not infrequently on CIF. We could ask him about that for example. Reading comprehension is a tricky thing. I’m accusing you of circular reasoning – You know it was staged because it couldn’t be anything else. The video is not sufficient to prove it was. You have to establish that the adults put the kids up to it and intended for something to happen to them so they could capture it. You can’t tell that by watching the video. Well, in the video I posted, they rush to help the kid after the car drives off (While the car is still there, one person almost rushes to him). Please try to remember what we’re alleging here. They deliberately let those kids get hit by the car. You can’t prove that by watching the footage we’ve got here. They aren’t even in view until after the kids are hit. You simply don’t know what they were doing beforehand. Well gee-whiz, maybe I happen to be wondering that myself? This is a totally different issue from whether it was staged. Andrew r all your excuses… what is your reasoning to counter Mita’s point, that the children had their faces covered and photographers standing around if they had just been to the mosque to pray? Oh and in the “analytic” video, it says another car drove up alongside Be’eri to prevent him from reversing his car. This kind of thing needs corroboration. You can’t even see the car moving or anyone in it. It’s called we don’t know because we weren’t there and the video doesn’t show everything we need to know. You might have been able to glean that from everything I’ve said until now. This seems familar. Photgraphers clicking away while dumb people, egged on by islamofascist supporting morons, read ism, wait for someone to be killed. Another saint pancake in the making. I’m sure “andrew r” is sad that no one was killed. It would have made a great headline for “der guardian”. Childrens lives were at risk and the adults did not act to protect them, instead they were taking pictures? Would you allow your child to run straight into an oncoming vehicle and do nothing but snap a photo? Shouldn’t the photographers have interceded? These are children, adults observing minors in dangerous situations who fail to act can be accused of childhood endangerment….children are not held liable for their actions. andrew r. should children be allowed to engage in dangerous actions for the entertainment of others? Should children be sent out to fight adult battles? Where’s your moral outrage? Kovacs, you’re an apologist for Jew-hatred. And there are quite a few victims of the real thing who are against Israel. Not so many as anti-Semitic putzes like yourself would have us believe. That was a sloppy remark. I really should have said there are quite a few victims of the real thing Israel is against. We know it was staged because there were cameramen, probably summoned prior to the event, to take those pictures! Would you seriously have us believe that they were just wandering along, cameras carefully primed, minding their own business while inadequately masked, “do or die for allah” children, (no doubt carefully cranked up by the PA’S broadcasts to little children about the joys of shahada on Palestinian TV) were playing chicken in the traffic? Why do you think they did not stop photographing after the first shot? Give it up already! You have made yourself into a complete twonk in front of the grown-ups. You are past the point of no return as regards credibility and everything else. And would you know “the real thing” (whatever that is) if it slapped you across the face? You claim that your one remark was “sloppy” – only to then claim that Israel “is against” its Holocaust survivors??? Serendipity – Since you’re so grown up, why don’t you tell me what you were saying about Palestinian kids during the first intifada when there was no PA TV. Given what part of the world they’re in those photographers could’ve been ready for anything. Maybe they didn’t feel obligated to stop the kids from throwing stones. I’m not saying they were mature and responsible adults. Only that we don’t know– ah enough’s enough..
Maybe they didn’t feel obligated to stop the kids from throwing stones? Some society? Adults are obligated to stop children from endangering themselves, it is the sign of a functioning moral society. Wouldn’t want you as a neighbor, anywhere in the world, if you feel no obligation to protect children. Jane, what do you think occupation soldiers do? The only way Palestinian adults can protect their children is to leave the West Bank. Spend some time reading the testimonies on b’tselem. This is what the Israeli soldiers (border police are also soldiers) do, rock throwing or not. To emphasize, Palestinian kids aren’t safe on the street and they aren’t safe in their homes. They’re just not safe no matter what they do. This is thanks to the IDF, not the adults. Actually, had the putz Andrew any real knowledge of the area, he’d know the inverse is true; middle-class Palestinian families try to get their children out of the Mideast, to remove them from the influence of the Palestinian leadership, who will ruin their lives. Testimony? Fabricated hearsay is more like it. Andrew seems little more than a terrorsymp stooge parroting the terrorsymp line. Andrew r you really so ignorant? If the Palestinians could bring themselves to make peace their children would have a secure home. Unfortunately even the ‘moderates’ in the WestBank have declared that they refuse to recognise Israel as a Jewish state and that they refuse to agree to land exchanges. In other words they wish to condemn their children to more years of living under ‘occupation’. When they refuse land exchanges they refuse to negotiate even for a land bridge to Gaza, thus declaring their enmity with their Gazan kin to be as fixed as that with Israel. andrew r, Who dresses their children up in masks and mock suicide belts? As for occupation, yes, end the occupation of Gibraltar. Well, I can see the concern for Palestinian kids doesn’t extend to believing what they say. Am I surprised? No. andrew r, why do you think B’Tselem is reputable? What a cop out….Palestinian children are not safe in the street….blah,blah,blah….Some things Palestinians do have control over, such as discouraging their children from running into 2 tons of steel while throwing rocks….there are no guarantees of safety for any of us anywhere in this world, anytime in our lives….poop happens, but the action by these children with the lack of action by the adults present is a full guarantee of poop happening! What a bizarre rationale you have to defend this lack of action by photographers and adults on the scene at the time? In essence your defense is these children are not safe anyway, so purposely placing them in an unsafe situation rather than trying to protect them is acceptable. Woe! These children are in more danger from your support than they are from IDF. This whole exercise is an example of children being set up to fight for adults, while adults observe from the sidelines, deal with it. To put it another way, since you seem to miss the point. Yeah, I’ll have to stop arresting them in the dead of the night, kicking them in the stomach and making their parents pay NIS 3000 to bail them out. Old habits die hard. And once again, you can not tell by watching the video if the kids were allowed to run at the car. You are a monster doing this. No wonder that you hate the Israelis who don’t allow you continue abusing Israeli Arab children. It’s almost funny how you work so hard at being ignorant. Almost. but many areas of the country are now treating these “kids” as adults…does that make america evil? now isnt it time for you to run back to max and mondoweis to report how evil the jews are on cif? Yeah, and Germany only exterminated communists. You are a Holocaust denier too? Now that the visitors of this site can see your real face – comparing Israel’s actions defending its citizens to the extermination of the Jews by the Nazis -there must not be any doubt about your agenda and worldview. Be a good “anti-Zionist” and go back to the Guardian CIF – your home is there. Not exactly – I’m likening what Kovacs said to Holocaust denial. Israel’s treatment of the Palestinians is closer to what the Polish went through under Bismarck. Although I would like Zionism to cease in Palestine before there really can be an apt comparison with the third reich. Not exactly – I’m likening what Kovacs said to Holocaust denial. Israel’s treatment of the Palestinians is closer to what the Polish went through under Bismarck. Maybe you should read your own post before publishing the next one. Lying is much more effective if your short term memory is functionning.